A Compromised Liver Is Never a Good Sign…Thank God That Milk Thistle Exists! Many herbs have tremendous medicinal value and have been used for thousands of years. As Western society catches up with other cultures that have done a better job of retaining knowledge of natural medicine, we “discover” plants that are specialists in attending to human nutritional needs. Milk thistle is one of these. The active flavonoid (a type of antioxidant) in milk thistle is silymarin, found in the flowers’ seeds. They can be used as a tea, the leaves in a salad, and the flowers as a vegetable. Milk thistle supplements can be found in tablet and capsule form. Silymarin is the active ingredient that is key to its effect on cleansing and maintaining liver health and preventing cancer. Your liver bears a heavy responsibility in your body, most having to do with filtering the blood to process the essential nutrients and remove toxins. It also helps in the production of proteins needed for blood clotting and bile, which is used for digesting food. Milk thistle increases glutathione levels in the blood. This powerful antioxidant grabs toxins, free radicals, and heavy metals as it courses through your body. Studies have shown use of milk thistle to reverse effects of liver cancer, inflammation, cirrhosis, and “fatty liver”. Additional studies have found milk thistle extremely beneficial in the treatment of viral hepatitis in as little as fourteen days. Research reported at the University of Maryland concluded that silymarin stops cancer cells from division and reproduction and kills them without hurting healthy cells. There are indications that when used as a sunscreen silymarin can reduce the incidence of skin cancer. Another study at Columbia University concluded that milk thistle initiated a marked trend in the reduction of liver toxicity in children with leukemia without affecting the chemotherapy agents applied. There is also evidence specifically linking milk thistle to the arrest and reversal of cancer in the lungs. Milk thistle is also an antidote to deathcap mushroom poisoning. In addition to fighting toxins and cancers inside the body, this stupendous herb benefits the skin, providing moisture and promoting softness, reducing inflammation and discoloration. 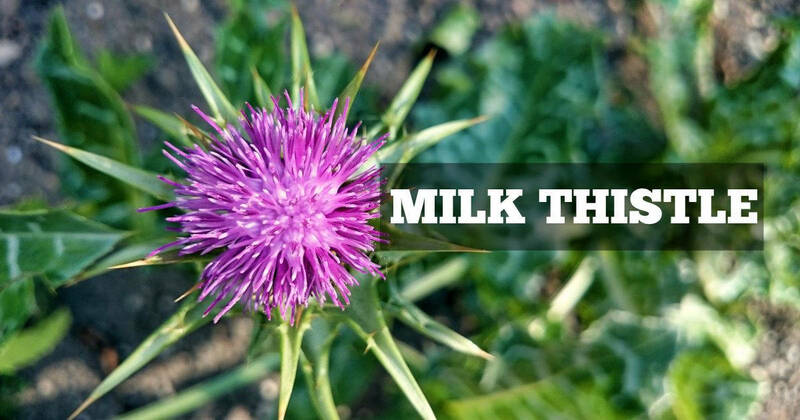 Milk thistle can interact with some medications so if you are taking any prescription or supplement on a regular basis, check with your health care provider before adding milk thistle to your diet. As we continue to learn and grow, we will be amazed at the ways in which the plants that just to happen grow around us can help us heal and stay well. Latest Headlines » Wellness » A Compromised Liver Is Never a Good Sign…Thank God That Milk Thistle Exists!